Pin nailers are handy tools for both DIY hobbyists and woodworking professionals. Pin nailers nowadays are more affordable and high-quality than ever. They are capable of driving very thin slight head or headless brads on delicate moldings without leaving a single trace. Whether it is for your kitchen cabinet, exotic furniture, or any other home remodeling project, these nailers can save you a lot of time and hassle. Let's take a look at how the top 5 best-sellers compare. Low maintenance and efficient pin nailers can make a real difference in your carpentry, picture framing, craft work, glazing bead, small moldings and other DIY projects. The Hitachi 23-gauge pin nailer could be just the pin nailer that you are looking for with its high-efficiency features. The big fastener eliminates need for frequent reloads, providing less downtime. The rear exhaust is a significant addition that keeps your work surface free of debris and oil. 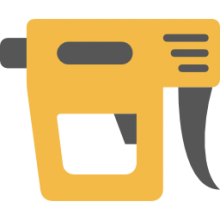 Another desirable feature is the indicator for reload, which helps to prevent dry firing, when you are out of nails in the fastener. The package includes 1/4inch NPT male plug, a hex bar wrench, safety glasses and a carrying case. 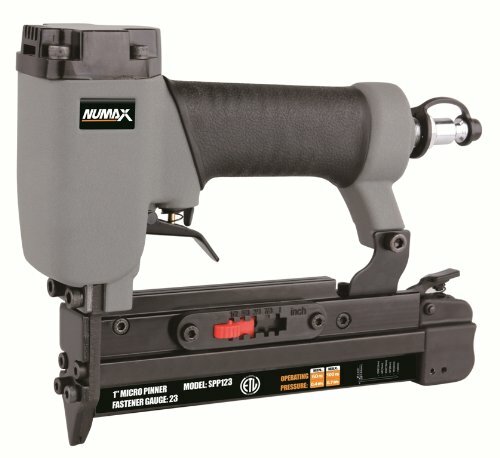 You can deftly complete custom work, detailed trim, hobby work and any other wood work finishing project in a surprisingly short time, using this lightweight-aluminum, 23-gauge NuMax pin nailer. This one-inch micro pinner works well on denser woods, as well. Made of aluminum, the pinner is favored by professional craftsmen. 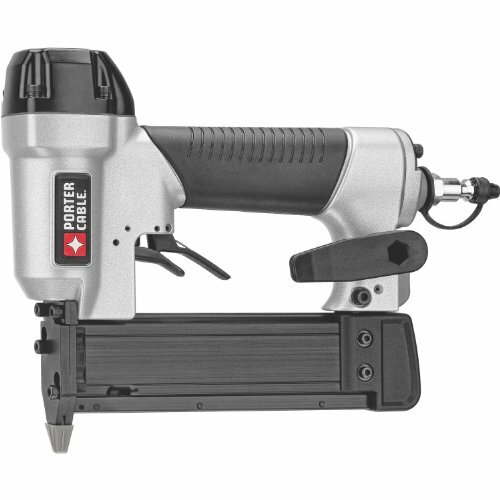 The nailer has adjustable pin settings and a top quality driver blade. This durable pinner comes with a one-year warranty. When you are working on cabinets, furniture, mantles and other interior wood work projects, a reliable pin nailer can make your work easier. The Porter Cable Pin 23-gauge pin nailer could be an ideal choice for you if you are looking for a durable, yet light-weight, model. The nailer has clamping and fastening features that can help with decorative or cabinet crown moldings, bead and rope molding, wood joining and other small trim works. It ships with 2000 ¾ inch nails, wrench, carrying case and a ¼ inch plug with cover. 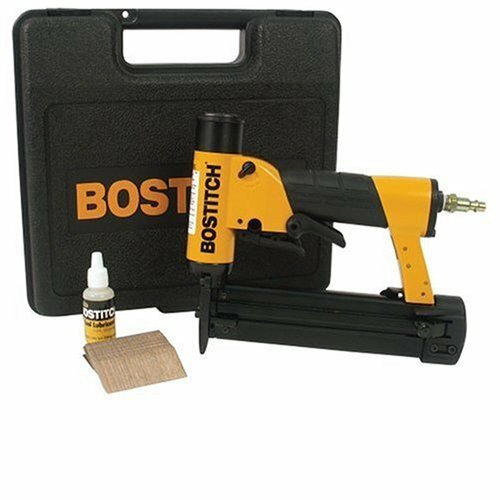 The Bostitch 23-Gauge 1/2-Inch to 1-3/16-Inch Pin Nailer could be a solid option for you if you are looking for an especially dependable and quality pin nailer to complete your woodworking, finishing or trim project. The quality pneumatic action and precision are stellar features of this particular model that guarantee optimum performance. The motor comes with a driving power of 60 in./lbs. The nose piece is tapered to ensure nails fasten accurately into thin or delicate objects. For difficult to clamp and tough fastening jobs, the Bostitch pin nailer could be a practical solution because of its high power and precise operation. Pin nailer does not countersink. The Freeman 1-Inch Pinner can make your cabinet and decorative projects easier with its ergonomic design and especially smooth operation. An oil-less, and aluminum pinner option, it has received solid reviews from its users for finishing up woodworking & craft projects. The O rings and 60-100 psi power features can provide a more hassle-free and durable operational life for this Freeman pin nailer. The exhaust system is a recommended feature for the pinner. It can be adjusted, so the exhaust is away from your face while working. The product has a limited warranty of 7 years. Some of you coming features of more advanced pin nailer is include non-marring tips, depth adjustability, reload indicators, rear exhaust functionality, large housing shields, and light-weight/rugged designs for easy work use. One Hitachi pin nailer purchaser writes that he was pleased with the comfortable trigger, the soft nose tip, quiet operation, ease of side-loading pins, the adjustability for different pin sizes, plastic molding, as well as the low-pin indicator being a bright orange that was easy to see. 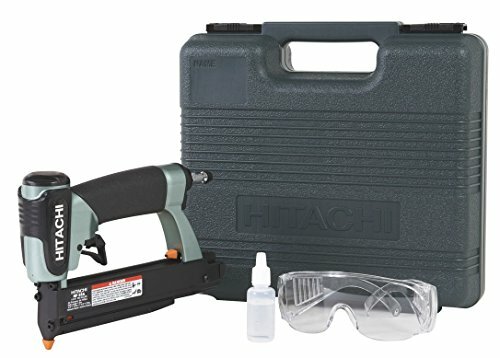 Buyers recommend that you pay attention to the accessories the pin nailer ships with- the Hitachi, for example, includes glasses, oil as well as two extra tips. 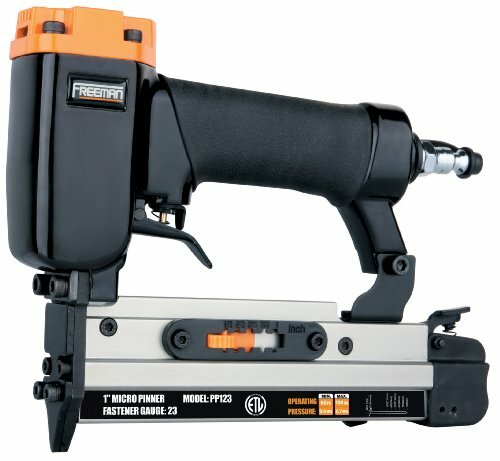 A Porter-Cable purchaser writes that it is one of the smallest and easiest to use pin nailers that he had ever come across, and he is usually a fan of larger brand-name and expensive models. He particularly enjoyed the fact that it accommodated his large and meaty hands as well as the spacious carrying case that came with it. Another reviewer writes the Porter nailer saying that it was an easy and comfortable work experience, being especially light and solidly constructed. This reviewer did note that when he first began using the device on Maple and Oak woods, he had to press a bit harder than he expected to drive the pins all the way in. Another advantage he observed of particular nailer is that has a 130 pin capacity with a dry fire lockout. Another reviewer writes that the Porter pin nailer has been a great addition to his furniture business-enabling him to do intricate work on exotic and semi-exotic furniture. One unique feature he observed is its ability to pin at an angle if you remove the plastic tip- this was especially useful for him while he was doing trim work and shooting the nails at a sharper angle. Probably the most common problem people experience with these pin nailers is their inability to drive longer pins-you can read in the comments section of their product pages in-depth discussions on which models are capable or incapable of driving longer length pins. Some sage commenters note that most of the complaints these devices have received are due to operator error-because the pinners are designed for highly delicate trimwork, and some people are trying to use them as brad nailers or even as finishing nailers. If you are looking to purchase a quality pin nailer, make sure you read a lot of reviews. Also check which accessories will be included with the item, the warranty and also be sure to understand the pin nail length that you will be working with. This can have an influence on the nailer that you eventually decide to purchase.